Large Floor Graphics - Lake Graphics Label & Sign Co.
Add visual interest with graphics or logos to entry ways, gyms or any surface with professionally printed large floor graphics. Printed on special adhesive vinyl and non-slip laminate, large floor graphic decals can be applied to many surfaces, indoors or out. Use for branding, promotional, informational or decorative purposes near entrances, in hallways or in any room. Wide format floor graphics can cover the entire floor space or be contour or halo cut to the edges of the lettering or design. 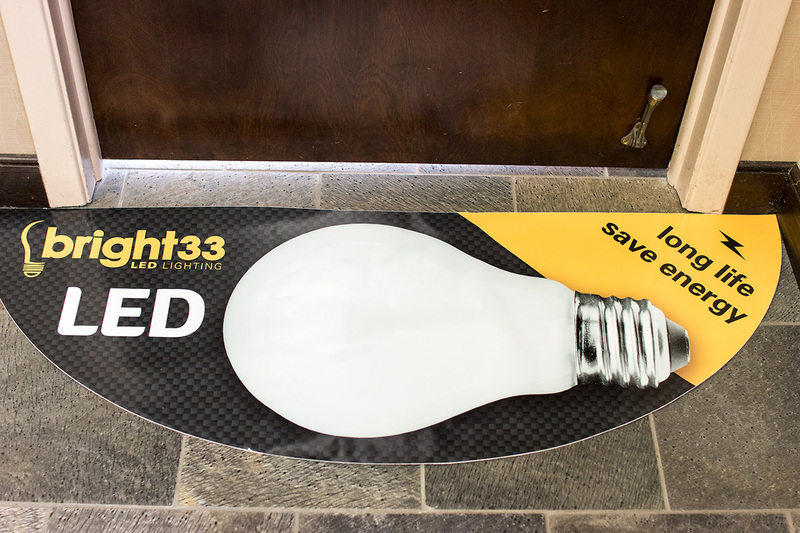 Floor graphics are available in a variety of materials with adhesion appropriate to the surface; all are slip-resistant and highly durable even to heavy foot traffic. We can help you choose the best substrates and finishing for your unique floor and usage. At Lake Graphics Label and Sign Co. Inc. we take pride in providing the best printing quality and faster turnaround times at competitive prices. And after working with our expert, friendly and professional staff, you won’t want to take your floor graphic printing projects elsewhere. We can print high-quality, wide format banners up to 3.2 meters wide using 8-color process. For wider floor graphics, we print panels that can be pieced together side-by-side or with a predetermined overlap to ensure a perfect finish. We also regularly produce difficult or custom projects that other printing services are unwilling or unable to take on. And if you need signs, promotional decals, stickers, or more – we can print those too.